Sinclair products, Photograpms of the Year, 1938. James A. Sinclair & Company Ltd was a camera-maker in London from about 1904. Sinclair himself was at one time an employee of Adams before setting up his own firm. Sinclair was also involved in Newman & Sinclair, at the same time as Sinclair & Co. was operating independently. N&S made (among other products) shutters, which are seen on many of Sinclair's cameras. Sinclair also retailed photographic goods of other makers. 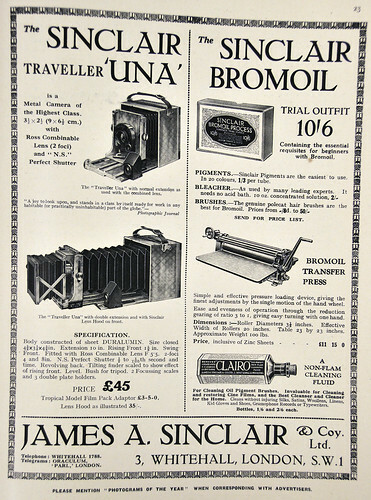 Sinclair is best-known for the Una series of wooden-bodied folding plate cameras in various sizes between 2½x3½ inch (6.5x9 cm) and 5x7 inch, including tropical models, and the aluminium-bodied Traveller Una, pictured here in a contemporary advertisement. ↑ Sinclair company information at Early Photography. ↑ Notes on the Una range at Early Photography. ↑ McKeown, James M. and Joan C. McKeown's Price Guide to Antique and Classic Cameras, 12th Edition, 2005-2006. USA, Centennial Photo Service, 2004. ISBN 0-931838-40-1 (hardcover). ISBN 0-931838-41-X (softcover). p895. Tropical Una, and information about the plate sizes and development of the Una range over time. 2½x3½ inch (6.5x9 cm) Tropical Una, about 1915, mahogany with brass binding and fittings, with Ross lens and Newman & Sinclair 'Perfect' shutter, sold at the sixth Westlicht Photographica Auction, in November 2004. There are focus scales on both sides of the bed; it is probable that the lens is a combinable lens, as referred to in the advertisement illustrated, and fitted on the Traveller example below; one of the scales shows focus for one lens component used alone as an 8-inch long-focus lens. There is a small Watson viewfinder on the bed, and front-rear and left-right spirit levels on the front standard. The camera has front rise and tilt. 4x5 inch Tropical Una No. 2, about 1920, with 7¼-inch f/4.5 Ross Xpres, sold at the eighteenth Westlicht auction, in December 2010. Rack-and-pinion focus on the bed, with an ivory focus scale to two yards, with depth-of-field markings (the camera has triple extension, so could focus rather closer). There is a seperate infinity mark for use with a telephoto attachment. There are levels (by Taylor, Taylor & Hobson) on the standard. The camera has no shutter (as shown; the lens may have been exchanged), and no viewfinder other than the ground glass. 4x5 inch Tropical Una No. 2 with Dallmeyer Stigmatic series II lens and behind-the-lens telephoto attachment, sold at the nineteenth Westlicht auction, in May 2011. This example has no focus scale or levels, but is otherwise similar to the camera above. Aluminium-bodied 2½x3½ inch (6.5x9 cm) Traveller Una essentially as pictured above, sold at the sixteenth Westlicht auction, in December 2009. The camera has a Ross Combinable lens (when combined, a 4¼-inch f/5.5; when one component used, an 8-inch f/11) and N.S. 'Perfect' shutter, with speeds 1/2 - 1/50 second, and a compendium hood. It is dated in the auction listing to 1927, but the serial number of the lens (137291) suggests this should be 1937. The camera has front rise (and swing, according to the advertisement). There are three marked degrees of rise ('1', '2' and '3') on the lens board, and the Watson finder on the bed can be tilted up, showing the approximate effect of each position on the view (again, according to the advertisement; Early Photography also describes this feature. There is a single, round spirit level on the front standard. This page was last edited on 21 June 2013, at 10:48.